Packed with nutrients & Delicious! I couldn’t wait to share these BLUEBERRY BLISS BITES with you! They are my new favorite Bliss Bite, right up there with our favorite Almond Butter Chocolate Chip Energy Bites. The backstory: When we were in London over February break, I was lucky enough to stop by one of Deliciously Ella’s delis and pick up some Protein Balls and Oat Bars. I fell in love with her Almond Butter & Blueberry Protein Balls. Since we can’t purchase them in the US, I knew I had to recreate them. So these are inspired by and adapted from her recipe. And I can honestly say that these little bliss bites powered me through a crazy week here. 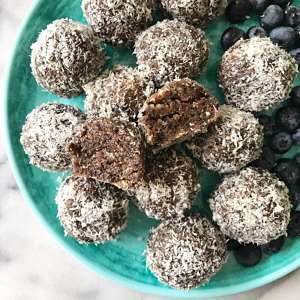 Made with Almond Butter, almonds, dates, maple syrup, hemp seeds, chia seeds and freeze-dried blueberries, they are packed with goodness, not too sweet and soooo good! The perfect healthy snack any time of day. Gluten-free, Vegan and No Bake, these Blueberry Bliss Bites are the perfect grab and go healthy snack to have at the ready in your refrigerator or freezer. Inspired by and adapted fromDeliciously Ella's Almond Butter & Blueberry Protein Balls. Place almonds in a food processor and process until coarsely ground. Add dates and pulse until chopped and well combined with nuts. Add almond butter, hemp seeds, maple syrup, blueberries, chia seeds and sea salt. Process until the mixture is well combined, thick, smooth and has a dark blue-ish tint from the blueberries. You will have to scrape down the sides several times before mixture is well combined because it will be thick. Form mixture into golf ball size balls with your hands. Your hands will feel "oily" as you do this because the oils have broken down from the nuts during processing, but that the bliss bites will not be oily. Roll balls in coconut. Store in a sealed container in the refrigerator. Stores well in the refrigerator for 7-10 days. Or keep in the Freezer for a few weeks.